Palestinian Authority Arab terrorists in Gaza fired a Qassam rocket at southern Israeli civilians Monday night, causing fear but no damage. 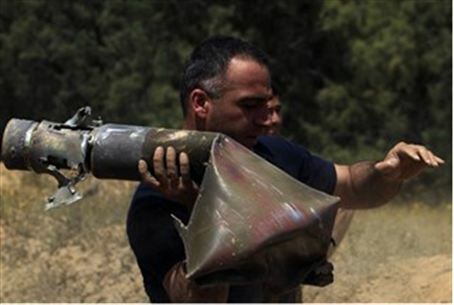 Arab terrorists in Hamas-run Gaza resumed rocket attacks on Israel Monday evening, launching a short-range Qassam rocket at southern Israeli communities in the western Negev. The rocket exploded in an open field in the Sha'ar HaNegev Regional Council district at about 8:15 p.m., triggering anxiety attacks in some people but causing no physical wounds. Those who suffer with post-traumatic stress disorder (PTSD) also had symptoms triggered by the activation of the Color Red rocket alert siren in communities around the area. "STOP IT!!!!!" tweeted one distressed writer on the Twitter social networking site, who added, "Southern Ashkelon under attack - Color Red sirens 2 minutes ago .... Israel under fire from Gaza again!" It later became clear that although the siren had activated in all the surrounding areas, the rocket struck only Sha'ar HaNegev. No damage was reported to any property in the area. At least 242 cities and towns, comprising about one million Israeli civilians are exposed daily to the threat of rocket and mortar attacks fired by Palestinian Authority Arab terrorists from Gaza. Over the past year, at least two Israelis have been killed and approximately 50 others were physically injured, in addition to the many others, including children and the elderly, who have been diagnosed with PTSD as a result of the incessant attacks.